No Rub frees from dandruff and relieves itching, thereby preventing frayed long hair, bald tail root and short, unsightly manes. With bio-sulphurous fluid and urea to normalise all biological processes, the hair thus becomes shiny and healthy! Salicylic acid serves as an exfoliant and renews skin. Leovet® No Rub is rated 3.8 out of 5 by 8. 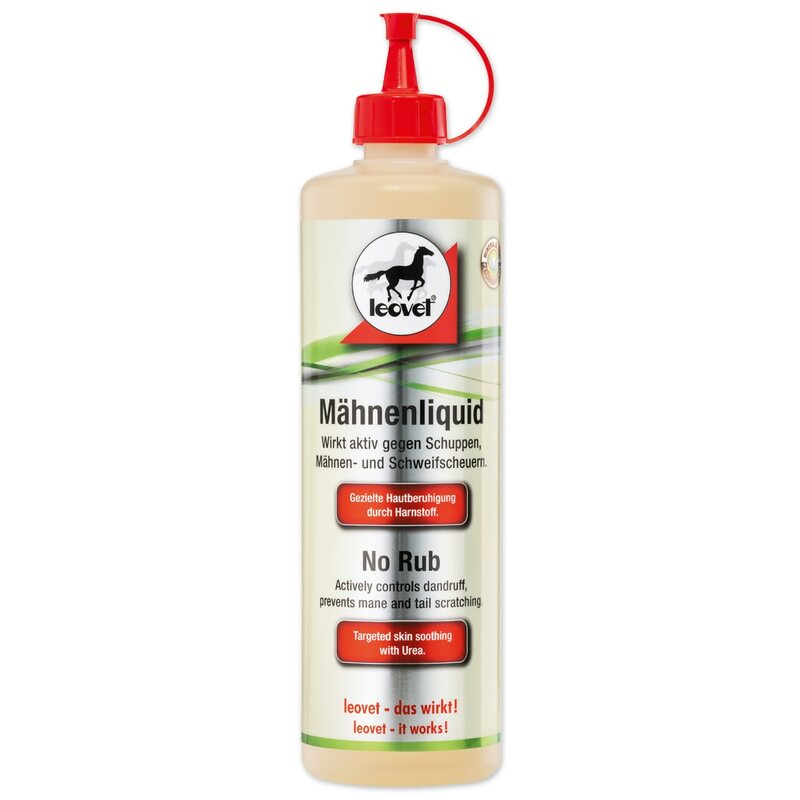 Rated 5 out of 5 by Arabique from Leovet No Rub Works I’ve tried everything to stop the itch but my horse continued to rub his tail until there was so much hair breakage that his tail became straggly and thin. Last resort I tried Leovet No Rub and it worked!! I highly recommend this. Rated 5 out of 5 by Zelda33 from No more rubbing after 1st application!!! Horse has been rubbing tail everyday for a year, after once use he stopped rubbing. I use this everyday. If I miss more than two days he starts to rub again. Rated 5 out of 5 by Becky from Really works! I have a few horses that rub their tails every summer. It makes it impossible to braid when its the show horse doing the rubbing! I have tried other products to no avail. This stuff stopped the itch and rubbing. I apply it every few days, and rubbing has stopped. I am ordering a bottle for my trainer's barn! Rated 1 out of 5 by Mtsequestrian from No results yet I have been using this product on two of my horses who have been running their tails. It's been 2 weeks and no results yet. I've had better luck with MTG which is much less expensive. Rated 4 out of 5 by FionasPotato from Starting to look better! My mare has a very flaky tail and has been rubbing all summer long. A fly sheet with tail cover usually helps, but I bought some of this about two weeks ago and it looks like it's improving! She still rubs occasionally, but the hair is growing nicely and it has very minimal smell, unlike other products. Rated 4 out of 5 by GT66 from Clear results in just a week! After a week the skin appeared to clear up and the flaking had stopped......no more itching. Rated 1 out of 5 by condor from Ineffective Bought this in an attempt to control my older gelding's mane and tail rubbing. On the plus side, it smells better than MTG. However, after using daily for several weeks, it has done nothing for the dry, flaky skin on his tail or the rubbing. Off to try something else!